DutchCrafters Mission Hutch measures 55" wide and offers three full hutch top and buffet drawers as well as 3 dovetailed drawers. It also comes standard with adjustable glass shelves, touch lighting and a beautiful mirror back. 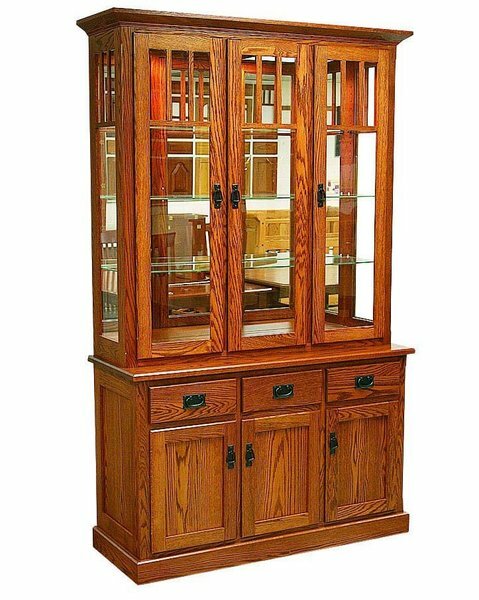 This Mission Hutch does not have mullions, but does feature a simple Mission crown on the upper edges of display windows. Give us a call at 1-866-272-6773 or stop by for a visit to our Amish furniture store in Sarasota, Florida. We look forward to meeting you soon.